DKH Academy in Highland Village, is the 1st Certified Nature Explore Classroom in Texas and the 26th classroom with this designation in the United States. 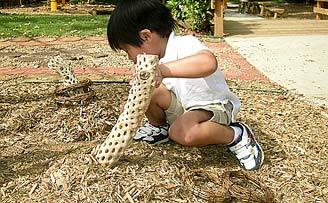 Experimentation and curiosity abound in the Discover Area where items such as bubbles, grapevine wreaths, cattails, bug catchers and magnifying glasses are used. Nestled in the woods of Highland Shores, this private preschool and kindergarten is owned and directed by Shelley Easler, who focused on using natural materials as much as possible while developing her outdoor classroom. 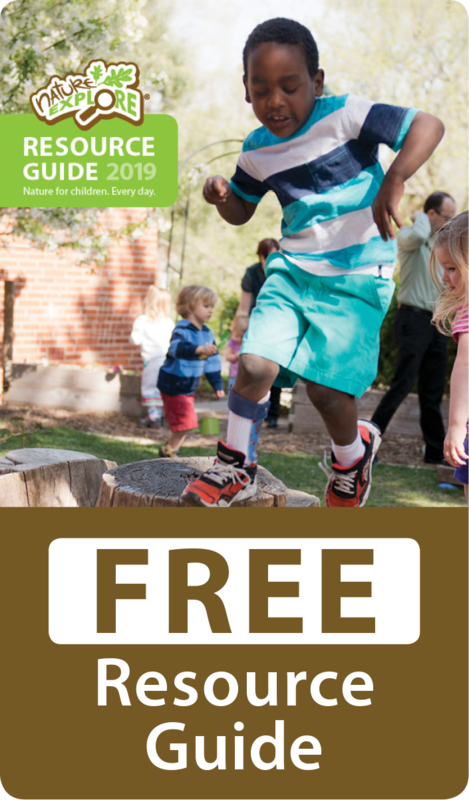 In the spring of 2009, DKH Academy sent flyers home to all families, inviting them to become a part of the planning and building of a Nature Explore inspired outdoor classroom. Excited families attended the initial meeting and many more volunteered all summer in order to develop a marvelous educational outdoor space for students to connect with nature on a daily basis. All areas are clearly divided into different activity areas. Brick pavers, flagstone, slate, grass, tree cookies, pea gravel, sand, rocks, engineered wood mulch, ivy and flowers cover the ground for a natural environment. This outdoor classroom contains 50 native post oak trees in addition to drought resistant, shade tolerant and hardy plants. Each of the areas is identified by a handmade, wood burned sign. The Music and Movement area encourages self expression in movement and sounds. Materials including puppets, scarves, streamers, dress up clothes, cymbals, akambira, slap drums, shakers and a variety of culturally rich instruments are rotated on a weekly basis to offer variety to the children. DKH Academy has made an effort to separate the quiet areas from the noisy areas. 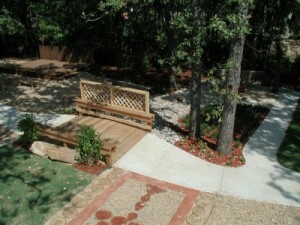 Unique areas include a “Slate and Chalk” area and a “Nature Watch” area. A beautiful natural cedar staircase leads through an arbor onto a tree cookie landing, which signifies entrance into a very special space. The Messy Area includes a sensory table whose contents are rotated on a weekly basis with materials such as sand, rice, pea gravel, flour, water and pinecones.